Suri Cruise spotted exiting from Tiffany & Co store and enjoying some Starbucks in NYC on September 29th 2013. 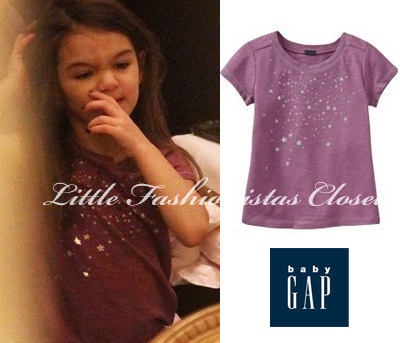 Suri was wearing Pink Stripe Sequin Tee SS'13 by Crewcuts and Basic Mesh Shorts in Pink by Justice. Suri Cruise did some shopping at the Apple store in NYC on September 28th 2013.
looks like Suri is wearing Navy Floral Leggings by John Lewis Girl. outfit info: Silver Star Print Top from Starry Night line by GAP, first worn on December 20th 2010 and Fanti Blush Sequined Flats by Nina Kids (first worn on October 14th 2012). It's a "walk-to-school" at The Avenues School! Suri Cruise walks to school on September 25th 2013. Suri was wearing Pleated Hem Black Uniform Jumper by French Toast. outfit info: Pink Sneakers by Puma (sold instore at GAP kids). Suri Cruise pictured exiting the Avenues School in NYC on Monday 23rd 2013. Suri Cruise pictured leaving nail salon in NYC on September 22nd 2013. Suri was wearing Fanti Blush Sequined Flats by Nina Kids (first worn on October 14th 2012). Suri Cruise left the house wearing PJ's and a bathrobe to grab a donut at Doughnut Plant in NYC on September 21st 2013. 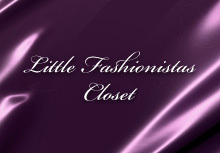 Pink Crazy Dot Robe by Sweet n Sassy and Fanti Blush Sequined Flats by Nina Kids (first worn on October 14th 2012). don't let your kids out of the house in pj's and/or robes!!! it's common sense. Suri Cruise pictured arriving to The Avenues School in NYC on September 20th 2013. Suri was wearing Pleated Hem Black Uniform Jumper by French Toast, Liberty Print Ballet Flats SS'13 by Crewcuts and completed her look with pink sunglasses and Fur Ball Headband FW14 by Pink Chicken. Thanks a lot to dancer173 for the headband id! 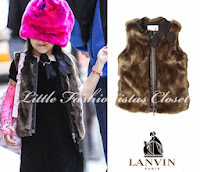 Suri Cruise pictured arriving ot The Avenues School in NYC on September 19th 2013.
and Mink Fur Vest FW'14 by Lanvin (first seen yesterday). a week ago there was an article on dailyhatemail smth like "no more designers clothes for Suri" as if Katie said that she can't afford it anymore.. well, maybe there was some truth in it, one might think, cause Suri was wearing all mall brands as of late.. no, not really! Suri went to school in NYC on September 18th 2013 - wearing Mink Fur Vest FW'14 by Lanvin (~$850) and Black Velvet Dress FW'13 (~$750) (sold out) by Lanvin, completing her outfit with Liberty Print Ballet Flats SS'13 (~$130) by Crewcuts.